Governor of Texas? Our Day Will Come! Rock Creek Hearing the news was a little like the sonic boom from an airplane high in the sky that reaches your ears before you can spot the trailing plumes or the shiny fuselage. It was as if women throughout the country breathed a collective sigh at the news that Rick Perry would not be running for a 4th term as governor of Texas. Perhaps he’s gearing up for another embarrassing and futile run for President because he didn’t feel he took enough of a whipping from his Republican competitors last time out. Frankly, who cares, let’s simply count our blessings while we can and be glad a lot of “our exes are in Texas,” as the country and western song, used to sing with Perry and now a couple of Bushes down there. 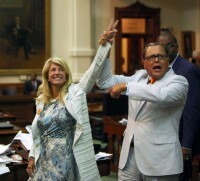 Some folks are pushing the courageous and upstanding state legislator from Fort Worth, Wendy Davis, as a possible Democratic candidate, believing that she has channeled a bit of the Ann Richards spirit through her 13 hour filibuster to block at least for a while an anti-abortion measure near and dear to Perry’s heart. She would be an exciting candidate, but Texas is big time politics, costing big time money, which is why Perry was able to finance a quixotic race for president last year even though he never could move the needle on the polls. He had long finagled one program after another for his friends and various businesses in order to grow the money tree so he could harvest when he needed to do so. Davis in her 2nd term is a marked woman in rough country even running for re-election in Fort Worth, so coming up with $20 million or so to be competitive in a Texas governor’s race could be a stretch. But, really that’s OK. Sometimes the giant killer doesn’t have to end up being the giant. In Arkansas years ago a fellow named Ted Boswell from near Bryant outside of Little Rock challenged the legendary rightwing populist, Democratic multi-term governor of that state, Orval Faubus, in the Democratic primary. Boswell was an attractive, progressive lawyer and gave Faubus a great race, though he fell short. Next time out though Dale Bumpers beat Faubus and everyone else and easily unseated Winthrop Rockefeller, the Republican incumbent. Boswell had shown the way. The same thing may be true for Davis and for Democrats in Texas. Increasingly the population trends are moving rapidly towards the day that Texas will once again be Lyndon Johnson sky blue. Maybe not in 2014, but possibly 2018 and almost certainly 2022, but whenever, the time is coming. Disturbingly some of the same numbers are saying that blue states in the Midwest and even Pennsylvania could turn as red as the South is now. We’ll worry about that later, but for now let’s join the women and poor people of Texas in celebrating the fact that Perry is finally leaving for another pasture. This entry was posted in National Politics and tagged abortion filabuster, Ann Richards, Democratic candidates, Governor's Race, red states, Rick Perry, Texas, Wendy Davis by Wade. Bookmark the permalink.